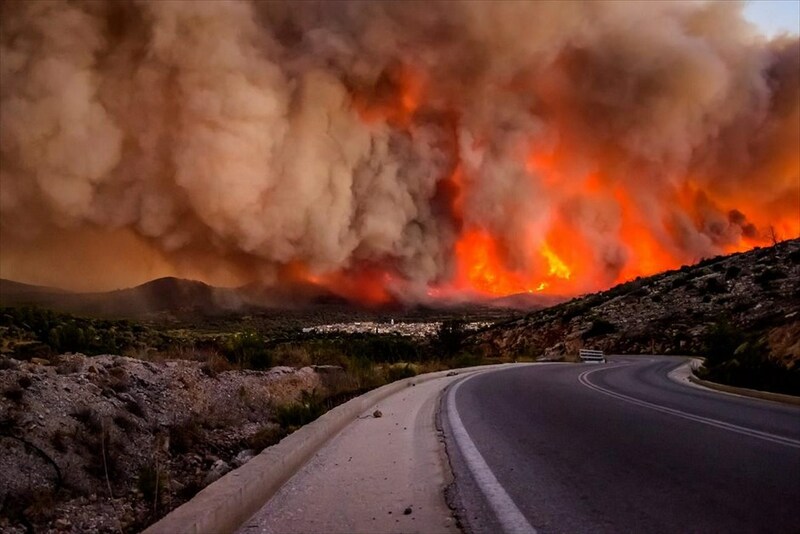 On July 24th, Greek capital Athens got hit by the worst wildfire that hit the continent since the second world war. 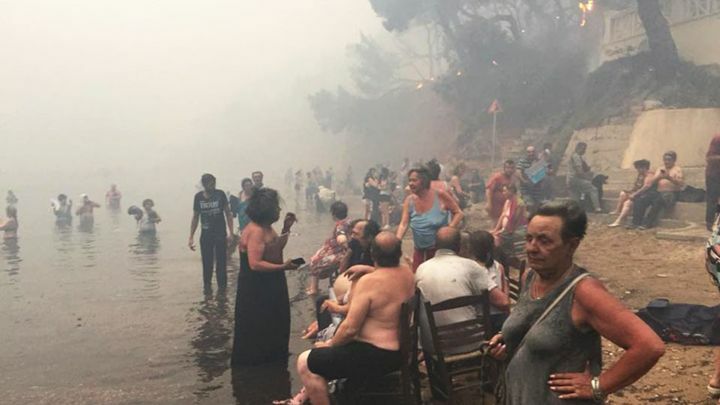 The devastating blazes that started off of three different locations in the Athens’ forests left behind a raising toll of 79, more than a hundred injured, and dozens of missing persons. A state of emergency had been declared in the Attica region, which includes the areas affected by the deadly fire. 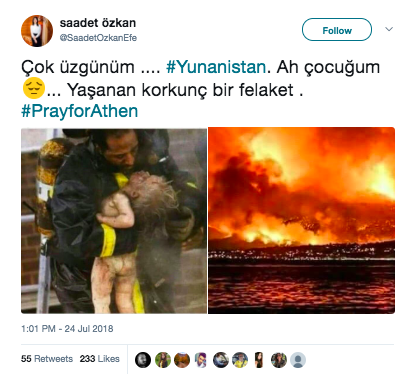 We compiled the false images that were widely shared on social media after news of the Athens wildfire broke. 1- The photograph was taken by the Pulitzer winning spot photographer Ron Olshwanger in 1988. 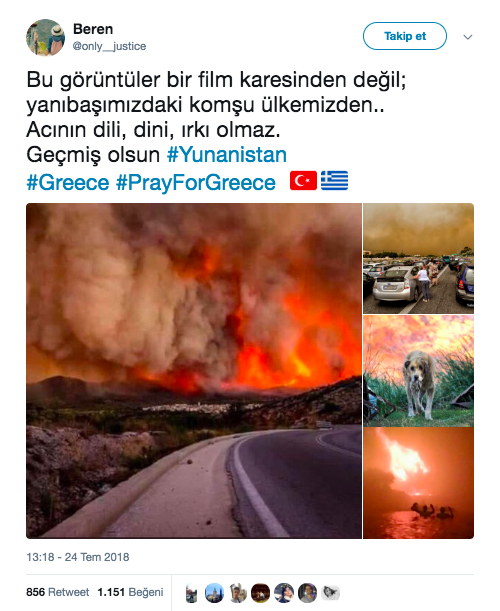 Teyit.org received user reports regarding an image that allegedly was taken during the Greek wildfires, which was shared by a user on Twitter and was favorited more than two thousand times. 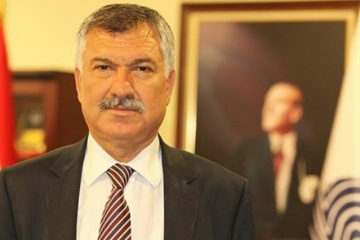 However, the image was not from the deadly fire in Athens. 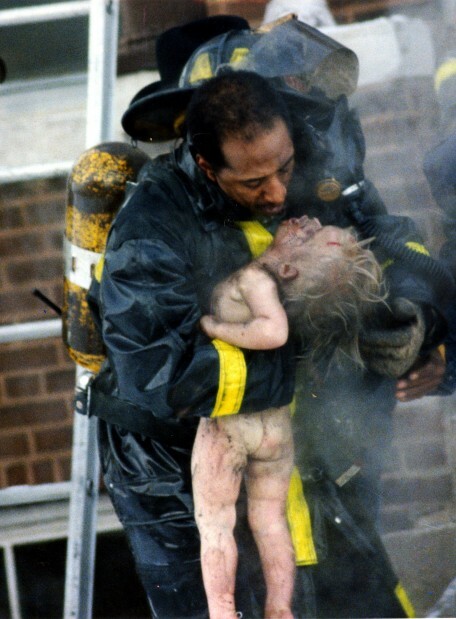 The photograph was taken by Ron Olshwanger during a fire in St. Louis, U.S.A, in 1988. The image that shows the fireman Adam Long as he carries the 2 year old victim Patricia Pettus out of a building is accessible online. It is also reported that after the rescue, Pettus lost her life at the hospital. Furthermore, the spot photographer Ron Olshwanger won a Pulitzer with his shot in 1989. A news story about Olshwanger’s passing on April 29th 2018 also mentions the Pulitzer Award he won in 1989. A New York Times interview with Olshwanger from 1989 is accessible online. In the story Olshwanger calls himself an amateur photographer. The story of the image can also be found in a book that compiles Pulitzer winning press images. 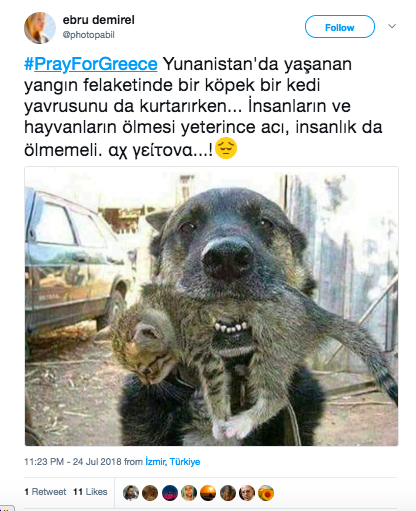 The image which was claimed to be showing a dog rescuing a kitten from the fire in Greece, was false. The photo was shared by multiple users on Twitter. 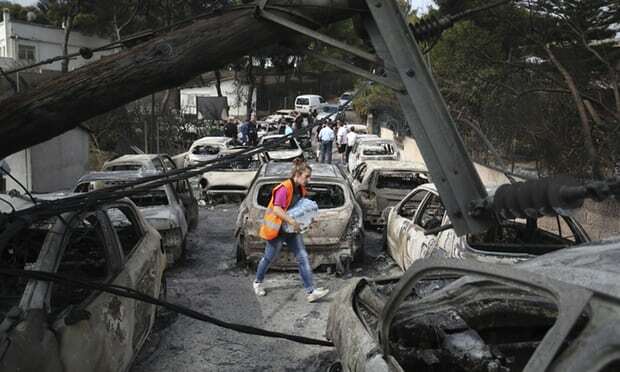 However it is not correct that the picture was taken during the fires in Athens. 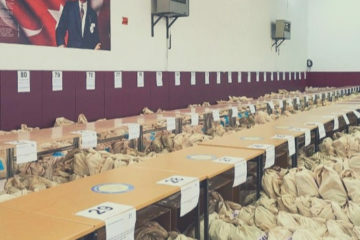 The image has been posted on multiple websites since 2014 and can easily be found online. A post on Reddit from three years ago, or another post from January 12th 2018 where 25 hero-dogs were listed on a different website, can still be accessed today. 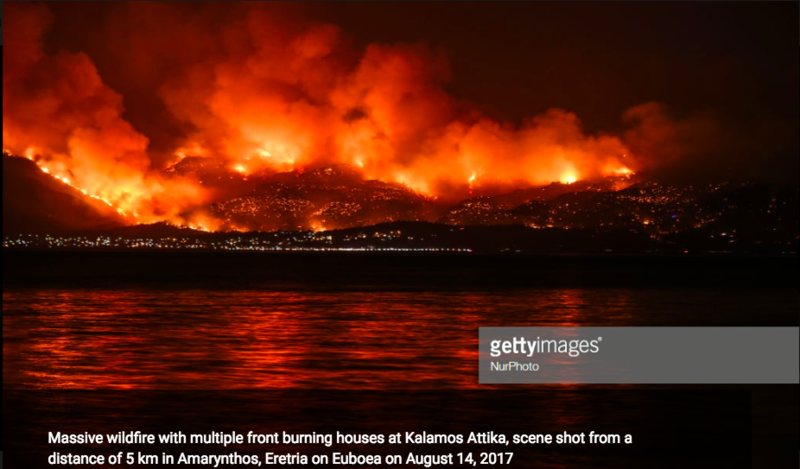 The image that was shared on Twitter and was claimed to be showing the devastating scale of the Attica fire as it engulfed the coastal line, was false. 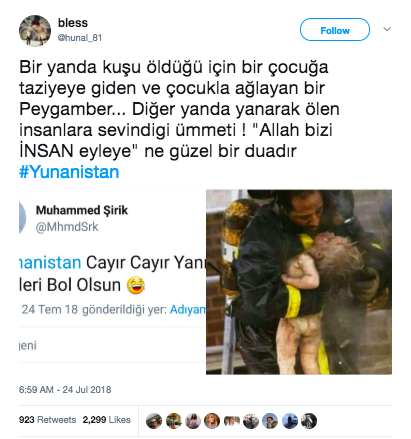 The photo is from a fire that started in Kalamost in 2017. On the stock picture website Getty Images, where the photo was posted, it can be seen that it was credited to Nur Photo Agency, and dated as 2017. The claim that the picture is from the 2018 Attica wildfires is false. 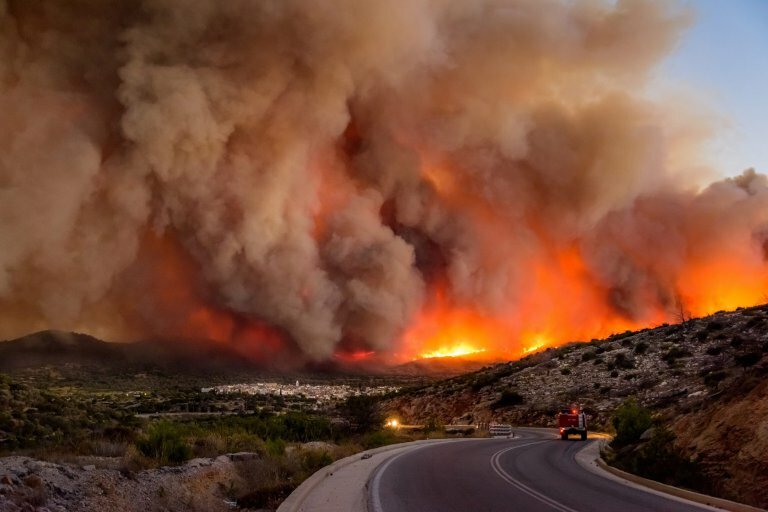 The picture was taken during the fire in the Chios island in 2016. Another picture that shows the Chios Island fire from a different angle also proves this point. 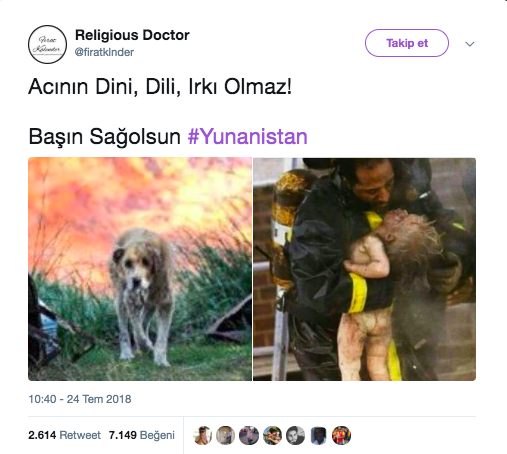 An image widely shared on social media with the hashtag #Yunanistan (Greece in Turkish) showed a dog visibly affected by the fire. The post from user “Religious Doctor” which included the picture was favorited more than 8 thousand times. However, this image was taken by the SOOC reporter Menelaos Myrillas after the Mikrochori fire in 2017. 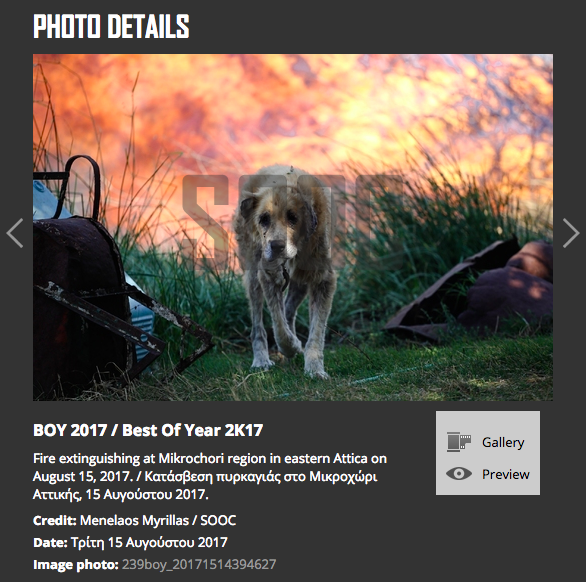 It was also selected as one the best photos of 2017 by the Greek news website Lifo. 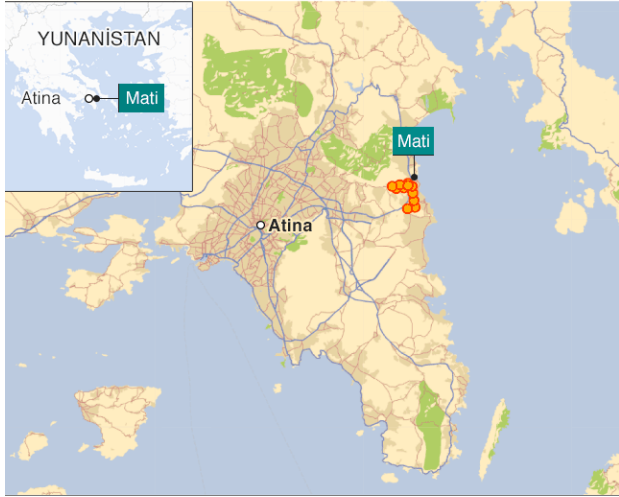 A state of emergency was declared in the Attica region after the fires that engulfed Athens and surrounding areas. Images from the scene exposes the disastrous scale of the tragedy.